Sri Lanka's cricket crisis has deepened after the dissolved board began a legal battle with the government. Suspended board president Thilanga Sumathipala ordered the closure of the organisation's Colombo headquarters on Monday and sent all employees home. Extra security has been employed to stop the government's six-man interim committee from entering the premises. Sri Lanka Cricket was taken over on Friday by a government committee, which accused it of mismanaging funds. But Sumathipala and the rest of the board remain defiant. They issued a statement on Monday claiming attempts were being made to "illegally" take over the headquarters. "Under the law, no member of an interim committee is empowered to enter into or takeover any immovable property belonging to Sri Lanka Cricket," it read. "The interim committee appointed by the sports minister has no legal authority whatsoever to act in the name of or on behalf of Sri Lanka Cricket." But sports minister Jeevan Kumaratunga has insisted he has evidence of financial misconduct within the suspended administration and says he had no option but to intervene. "People are acting as if cricket is their parent's property and are trying to cling onto power," Kumaratunga told The Island newspaper. "The administration of cricket is in a sad state and that's why I decided to appoint an interim committee. "Already a complaint has been lodged with the police and I will be taking appropriate legal action to stop this menace." 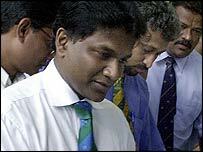 Under Sri Lankan law, the government can suspend or dissolve any elected body, and they must be approved by the sports minister before being made official. Sumathipala held the board presidency between 1999 to 2003 and was sacked by the then sports minister in 2001 over corruption allegations.